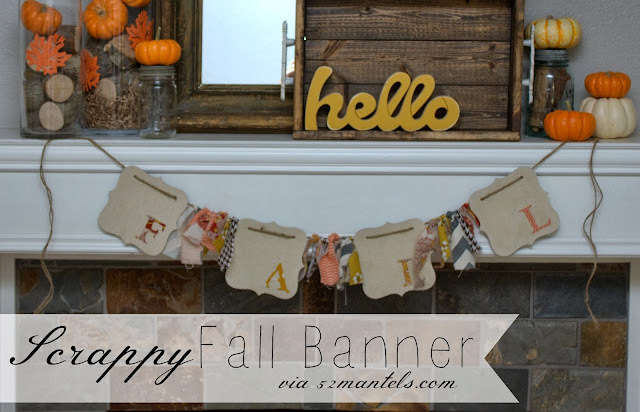 Several weeks ago, I shared my Fall mantel, which included this scrappy Fall banner. On that same day, I shared the tutorial with the readers of Dining, Diapers + Design. In case you missed it, I'm sharing the details here today! To make this banner, I started with one of those fabric-covered chipboard album kits from the dollar bins at Michaels. These kits are perfect because they come with 4 pieces and already have holes. Plus, they have a fun linen texture on the front. So easy and inexpensive! 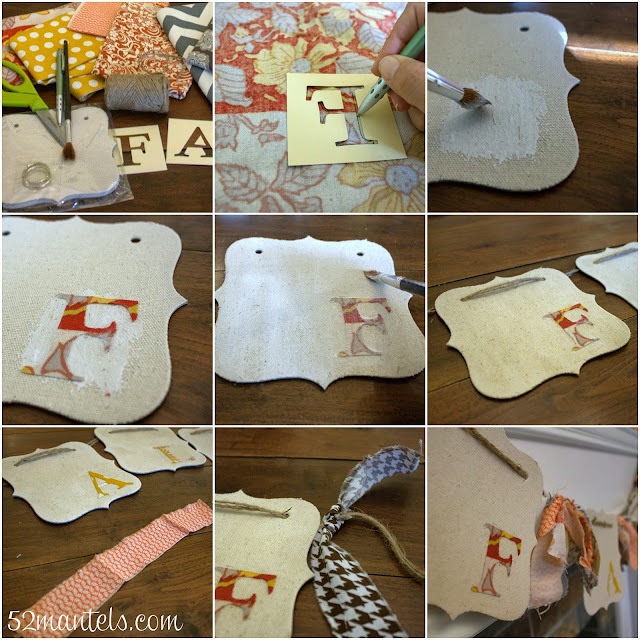 1) Gather your supplies 2) Pick 4 fabrics scraps and place a stencil letter backwards on the backside of each piece of fabric. Trace and cut out. 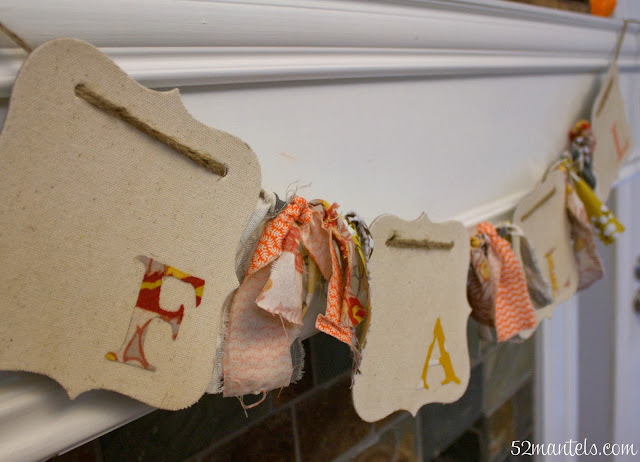 3) Paint a bit of Mod Podge on the chipboard, where you want your letter 4) Place one letter on each chipboard and paint Mod Podge over it 5) Paint Mod Podge over entire chipboard surface 6) When the Mod Podge dries, place the banner pieces on a length of jute. I doubled the jute for extra texture. 7) Cut out 15 pieces of fabric scraps, each about 2" by 5". 8) Tie each piece of fabric on the jute, between the banner pieces. A simple knot will due! I tied 5 pieces between each section of banner, for a total of 15. 9) Hang banner on your mantel! That's that! Easy as can be. And, inexpensive, too. Plus, this is a fun project to do with a crafty friend. My friend, Jill, came over for a crafting slumber party and we had so much fun! Jill's banner turned out SUPER cute and incorporated some of her signature turquoise. I'm not gonna lie, I kinda wanted to keep hers for myself! 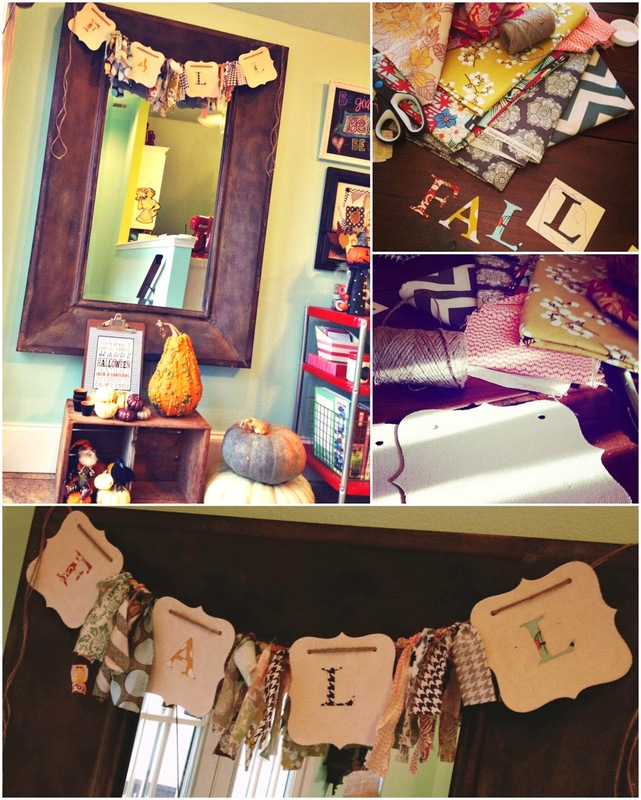 ;) She styled her banner on a big mirror in her home and it's perfect with her Fall decor. The two square pictures in the above collage were from our craft night. Fun times! Super cute project, Emily! Happy Fall! Oh love the fabric choices Emily! Such a great banner! I love this so much! It looks really simple too, which is nice because usually banner tutorials intimidate me for some reason. ;-) Thanks so much for sharing with us!